Pin 4 and 6: These are the power supply Pins of IC, Pin 6 for is +Vcc and Pin 4 is Ground. 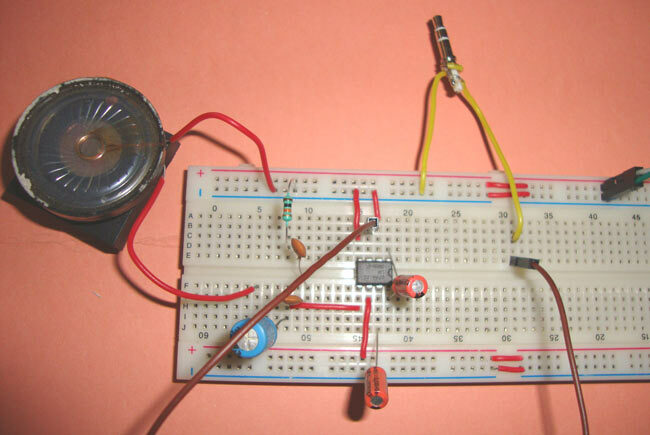 The circuit can be powered with voltage between 5-12v. Pin 5: This is the output PIN, from which we get the amplified sound signal. The output signal has both AC and DC component, and DC component is undesirable and can’t be fed to Speaker. So to remove this DC component, a capacitor C2 of 220uF has been used. 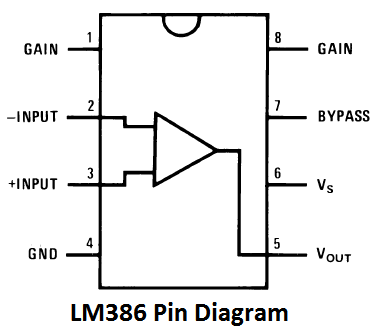 Along with this capacitor, a filter circuit of Capacitor C3 (.05uF) and resistor R1 (10k) has been used at the output PIN 5. This filter also called the “Zobel network”, this electronic filter is used to remove the sudden High frequency oscillations or noise. Pin 7: This is the bypass terminal. It can be left open or can be grounded using a capacitor for stability.